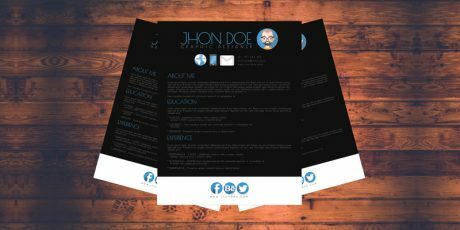 Collection of CV/Resume templates in editable vectors for Adobe Illustrator as well as PSD files for Adobe Photoshop. 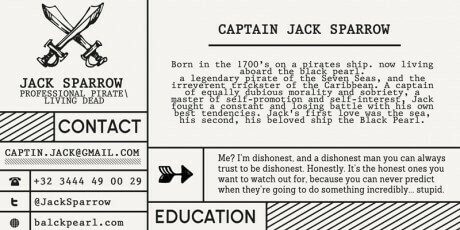 A resume template design with interactive features. 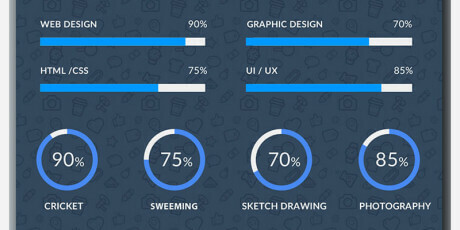 Created to be showcased as a complement or section in a website portfolio. It is structured using HTML, styled with SCSS, and interactivity with jQuery. Created by CodePen user Naomi Weatherford. 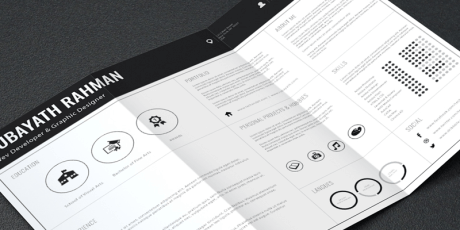 A minimalist cv template with super clean design for improve your job impression. It is available in Word, Pages, and Illustrator with 3 different frames colors. The template can be easily customized to your liking and includes all necessary files for a quick set-up, optimized for A4 paper size. Designed by Zohan Habib and published by SmashResume. 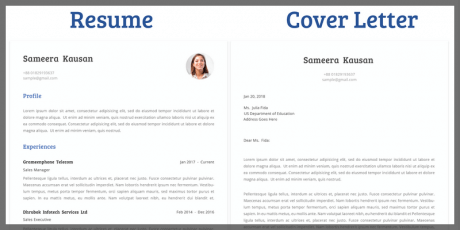 This is a colorful and modern CV/Resume template with a cover page. It comes in 3 color variations, making it two files per color and six per file format (PSD, Sketch, XD, DOCX). 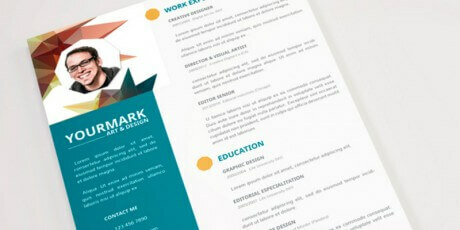 This CV is easy to edit and customize; it has the right space for showcasing your relevant information. Created by GetResume. 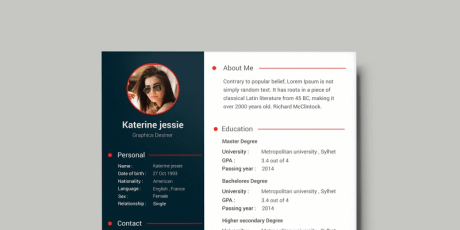 This is a layered resume template with a modern layout that allows arranging your information in a modern CV structure. The idea is that with the design you will convey all the important information in just one page. The template is in PSD file format and comes completely layered which makes it really easy to edit or customize. Created by GetResume. 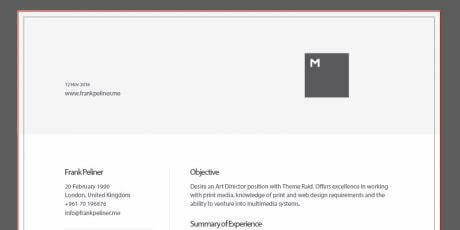 A minimalist and elegant pre-formatted resume template entirely editable with Word. Created by Kate Arthur. Great looking resume template with well organized structured objects, properly labeled to achieve great results in less time. Created with Microsoft Word to simplify the editing and customizing process. The download includes A4, Letter size resume and cover letter in docx and pdf formats. 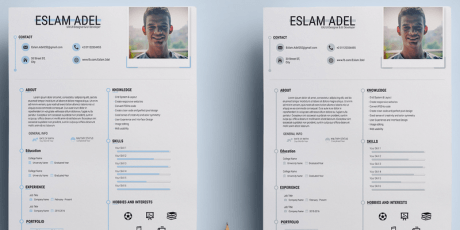 Ceev is a Chrome plugin that grabs the info from your LinkedIn profile and places it in a CV/Resume template of your choosing, with customization options available to tweak the content and customize color schemes, fonts, and themes, before exporting it as a PDF file..
Free Resume template with cover letter by Behance user Shoaib Mahmud. It includes templates editable in both MS Word or Adobe Illustrator, with a clean, minimal design, and a layout with clearly defined sections. markdown-cv is a simple template to list all your accomplishments in a readable Markdown file. It uses CSS to style your text into a stylish web page. It can also be printed as PDF. 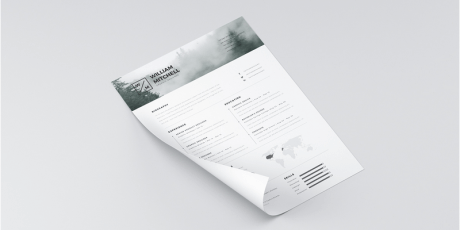 A clean, well-organized Resume Template freebie from Forbidden Designs, contains a file to work with on Adobe Illustrator for the resume, fully editable vector shapes to customize the template to better fit your needs. 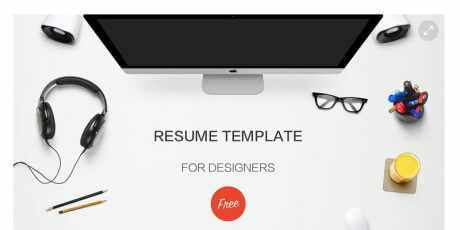 It also includes a PSD with over 300 free icons to use on your resume. A modular corporate branding pack that includes templates with a slick design for posters, folders, menus, cards, CV, trifold, flyers, quotations, invoice, company letterheads, etc. File formats in vector Ai and Adobe InDesign. Get the free version here! 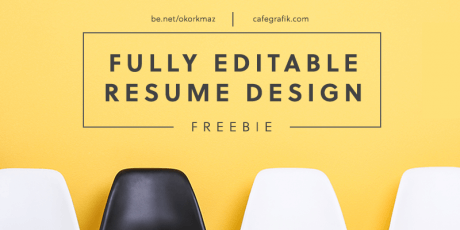 Resume template in A4 size featuring 4 different colors and easy to edit layers. The download includes PDF and AI files. Designed by Eslam Adel and released completely free to download and use. 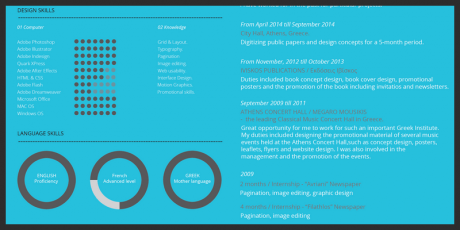 A colorful, fully editable resume template / CV. It includes PowerPoint PPT and Adobe Illustrator source files. A complete template for a CV, made in Adobe Illustrator and available for personal and commercial purposes. The template is clear, has supporting graphics and has several areas so you don't miss any information about yourself. 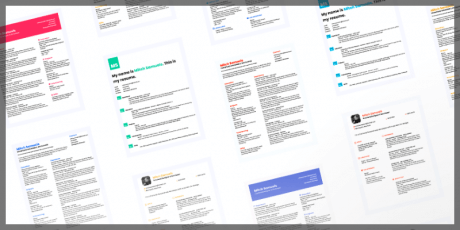 A set of 25 templates for CVs and resumes available in illustrator. This bundle includes multiple styles, and it is sorted by creative profile and profession, making it easier for you to show your expertise. 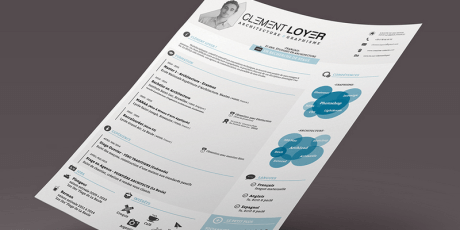 A cool template for a CV made by TemplateShock, totally editable in AI, PSD and INDD formats. The template has a simple style, featuring a color band on top and lots of white contrasted with the text and icons included. This can be used for personal purposes only. A template that comes in AI format, perfect to show your skills and abilities. The template includes icons and open fonts so you don't have to look for them anywhere else. It also uses graphics to display information in an organized and clean way. 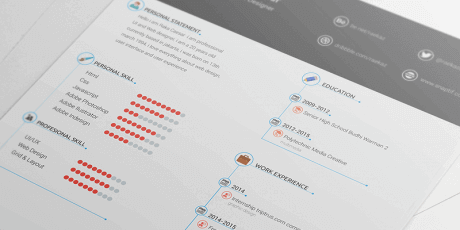 A cool resume template made in Sketch and PSD formats. It is organized in layers, including editable elements and it also has the fonts used so you don't have to look for it. It also comes in A4 and uses English as primary language. 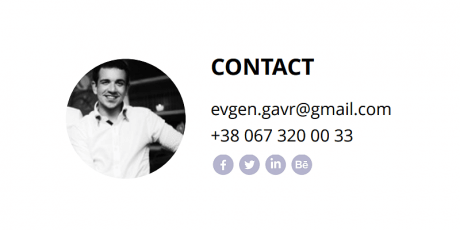 A CV website template that can be adapted as a one-page site for your freelancer portfolio. The template comes in HTML for easy integration, and includes areas for header, about me, experience, works, and contact. Packed with neat CSS animations throughout the layout, it features a parallax hero image, a beautiful timeline, and a stunning image gallery with transition animations to present your portfolio in style! 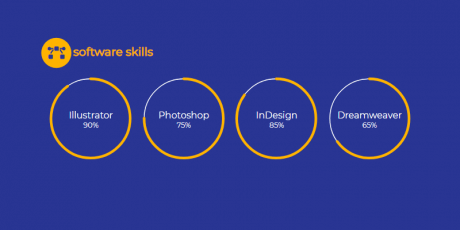 This awesome Curriculum Vitae design was made using fully editable layers, it comes in Ai, PSD and ID formats for everybody to use. It is designed with a 3D colorful template specially made for the most imaginative out there. Orbit is a nicely crafted CV/Resume template completely built with Bootstrap that comes available in 6 different color schemes. 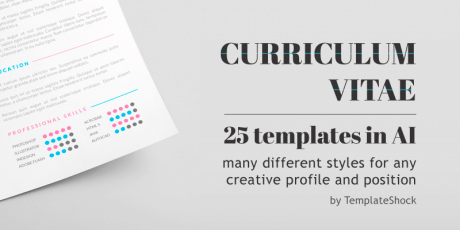 A set of more than 40 Curriculum Vitae templates counting on different styles to suit everyone's needs. They all come available in PSD, Ai, and InDesign format files ready to print in CMYK profile. 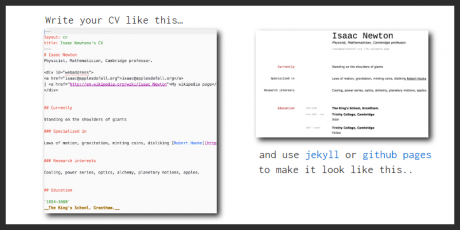 HackMyResume is a useful tool to generate résumés and CVs in HTML, Markdown, LaTeX, MS Word, PDF, plain text, JSON, XML, YAML, smoke signal, and carrier pigeon for Windows, OS X, Linux y Node.js. A resume template in a hand-drawn style that features nice professionally drawn squared sections and line shadowed separators. 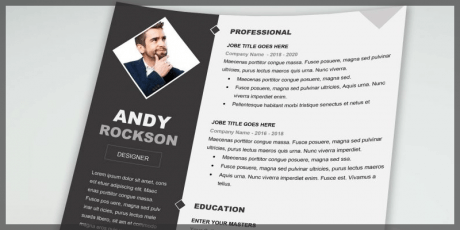 A resume template designed in a clean grey scale style and laid out in two columns, a narrower left-side one that contains a circled profile photo, name and infographics skills and socials; and a wider right-side one containing text described details. This template is a creation of Mats-Peter Forss and is delivered under CC BY-NC 3.0. 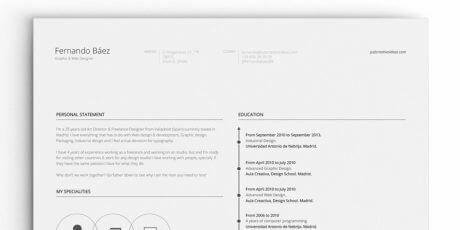 A Resume template designed by Fernando Báez that uses icons, allowing it to be more explicative. The template itself has a very clean style and features a few sections like specialities, design skills, languages and hobbies. The icons created by Brankic come packed with this template. 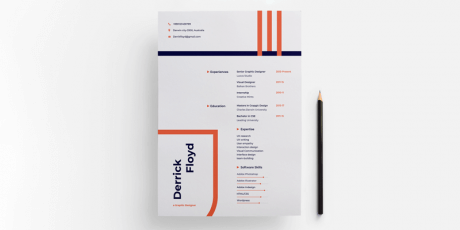 A very neat resume template in minimal design that features smart objects header and is delivered in both AI and PSD formats with a resolution of 300dpi in size A4. It was created by Mats-Peter Forss and licensed for personal use. 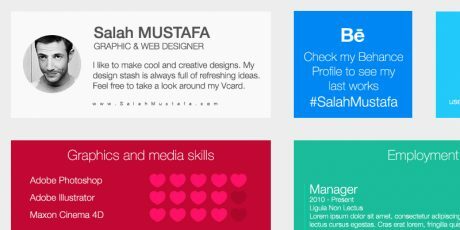 A useful resume template in PSD format for freelancer and regular people who just want to work in what they love. It's really easy to use and edit, every image is a smart object so it's easy to insert your own creations, layers are named properly, it comes in A4 Size + 2.5milimeter Bleeds and 300 DPI + CMYK. 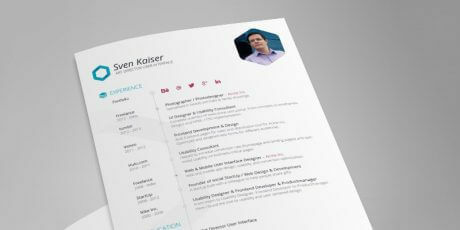 A nice template for a resume made in PSD format. It includes editable vectors for users to modify shapes at will, although it can be used as is. The template also includes fonts in OTF format, totally free to use. It was made by Clément Loyer. A crafted set of editable PSD templates made with a flat style and several design components. 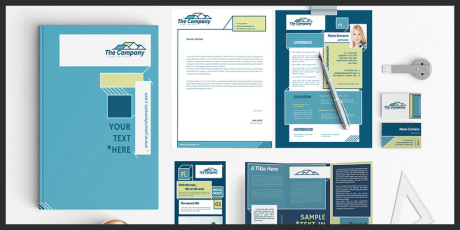 The pack includes templates for resume, portfolio, letterhead and business card that can be modified easily. 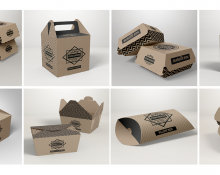 This pack is really lightweight, free and ready to print. 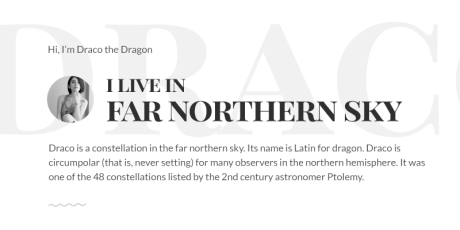 A beautiful and minimal template called Draco that comes in PSD and HTML formats. 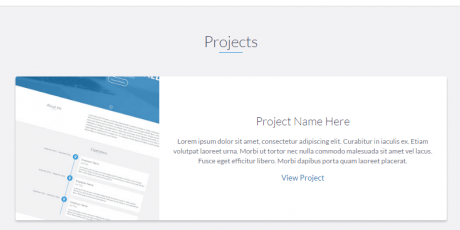 It includes a simple top menu, a title taking most of the top of the page in watermark style, and then it has areas for work experience, awards and technical skills. It is free and was created by Afnizar Nur Ghifari. A professional CV template made in AI format for those in need of a great way to show their abilities and skills to potential employers. 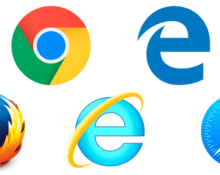 It uses the Oswald open font and also an icon set with more than 400 icons. The file is really lightweight and can be used freely. 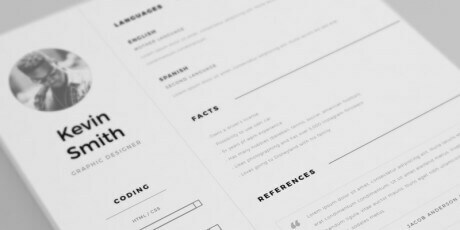 A beautiful and simple template for CV, focusing on the profile of the person, made in AI format. 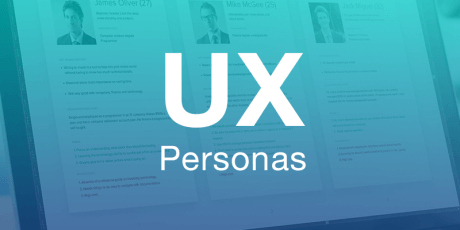 It includes profile pic, name, contact info space, user story, goals and more. It was created by Alex Gilev. 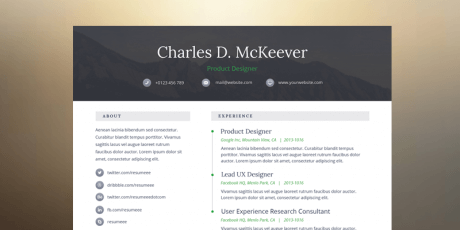 A beautiful PSD template for a resume or CV made in PSD format. It includes different areas, all made in vectors for easy edition. It features a personal statement, skills with graphics on personal and professional levels, education, work experience, interests and more. 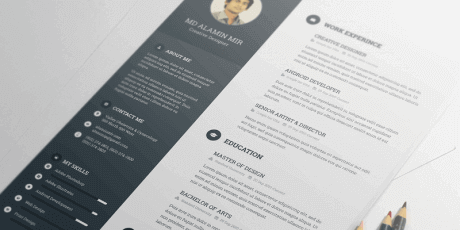 A template for a resume made in PSD and totally free to download. 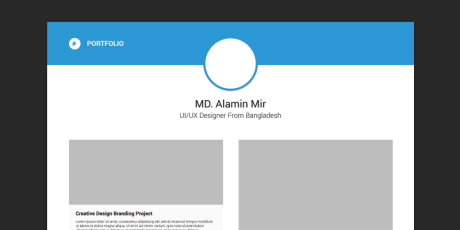 Perfect for freelancers, it highlights your experience, keeping the right part for the extended information and the left bar for photo, contact information, social networks and skills This template for a resume was created by Alamin Mir. 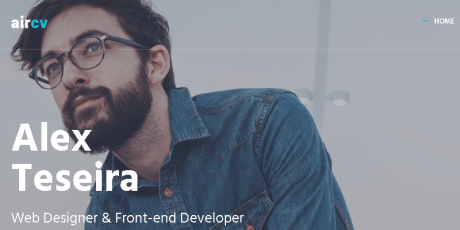 Vita is a minimalistic CV/Resume template for you to use as a base while showing you personal and contact information for a potential employer. It includes a serious yet colorful design, fully organized in an Indesign file with a business/corporate style as a free source. You can edit it easily, and is free for personal and commercial projects. 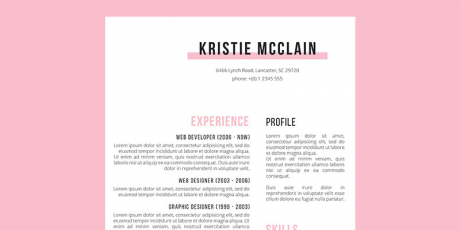 A beautiful CV template in a flat style. It comes in PSD format, with vectors for easy edition. 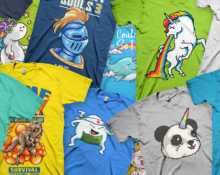 Also, it is colorful, combining a wide variety of them with grey. The design uses tiles, and you can see different widgets carefully organized. 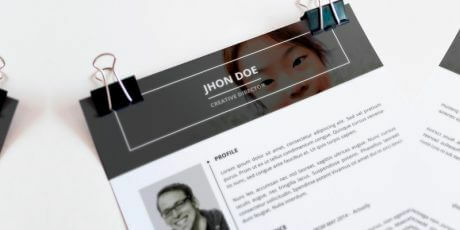 ​​A nice template is perfect for resume websites. It is divided into several sections in a single page, including the menu, about me page, skills, education, experience, testimonial and contact. 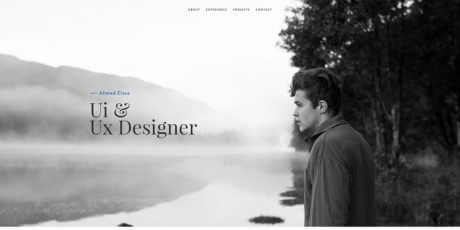 It is perfect for an online portfolio site as well. 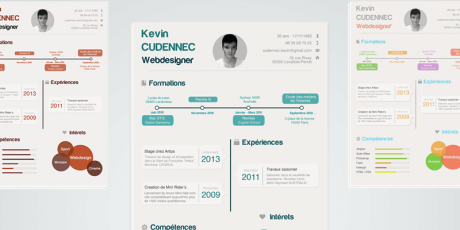 A PSD resume made with the style of an infographic to display different data. 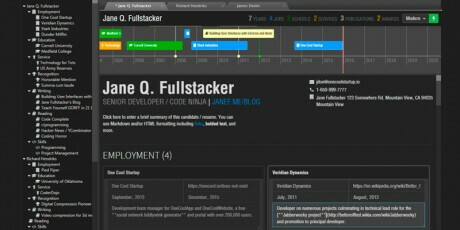 It includes elements like the profile picture, education area, timelines, dates, bubbles, bars and more. It is free and it was created by Kevin Cdnc.